I usually prefer eating whole fruit rather then preparing juices and that's the reason I don't have many juice posts in my space. Moreover juices are simple to prepare so posting recipes of fresh juices may not be required but according to me, a juice can be prepared with several variations and hence am posting one such recipe today. Look out for the finer points in the notes section. I usually prefer milkshakes to juices but a few fruit varieties are not suitable to prepare milkshakes and tastes best in the form of juice. Watermelon belongs to this category and as it has high water content one can eat it as it is or turn it into juice. 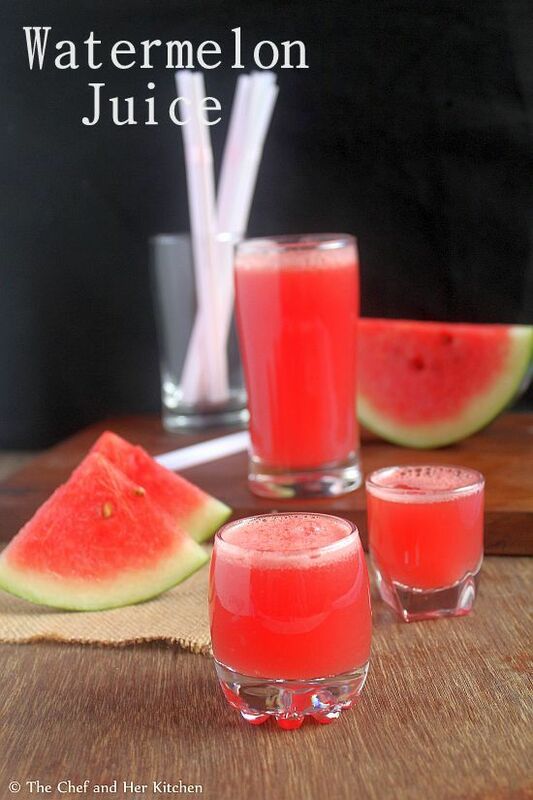 I have been planning to post water melon juice from a long time as the colour of watermelon juice is captivating and appetizing!! But to my bad luck, the day I had planned to take pics, the weather was very gloomy and made me struggle to capture this gorgeous juice. I am not very happy with the clicks and did not meet any expectations from what I had actually thought in my mind, anyways would like to capture more juices in future to bring those bright colourful juice recipes in my blog. If you are interested check out other interesting beverages like Mango Lemonade , Bonda Juice(Tender Coconut Cooler), Butterfruit(Avocado) Milkshake and Oats-Fruits Smoothie. For a complete range of beverages check here. Cut the watermelon and remove the seeds. I do not prefer ice hence I avoid it and refrigerate watermelon pieces for some time. Blend the watermelon pieces with sugar and water to a smooth juice. Do not add water at one shot, add it in intervals and also according to you required consistency. Now taste it and add more sugar if needed. Strain the juice. Serve it by adding ice cubes. 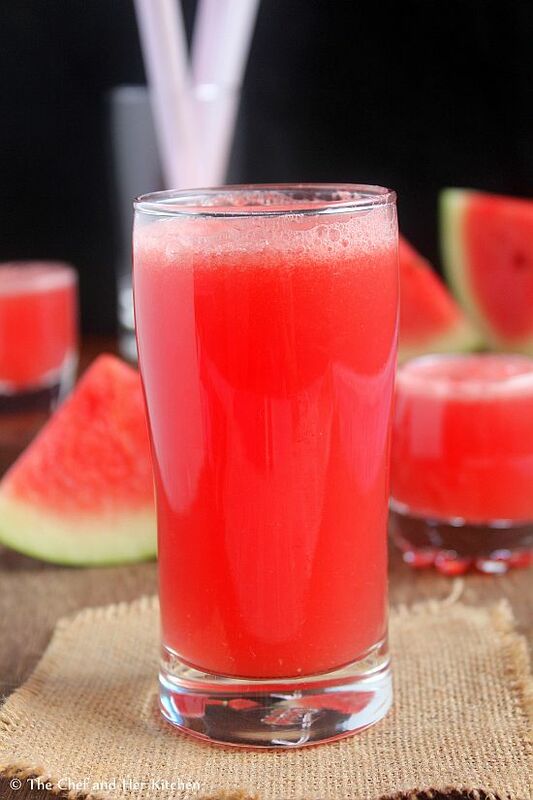 This is a very basic water melon juice recipe with out any flavours. If you like you can add 1-2 tsp lemon juice or 1 tsp chopped ginger while grinding it for extra punch. You can even freeze watermelon cubes and blend it with sugar like a smoothie. Various fruits like pomegranate, oranges, mosambi(sweet lime) and grapes can be combined with water melon. Sugar can be replaced with honey in the recipe. You can also prepare with out sugar by adding mint leaves, chaat masala, kala namak and roasted cumin powder for a more chatpata juice. 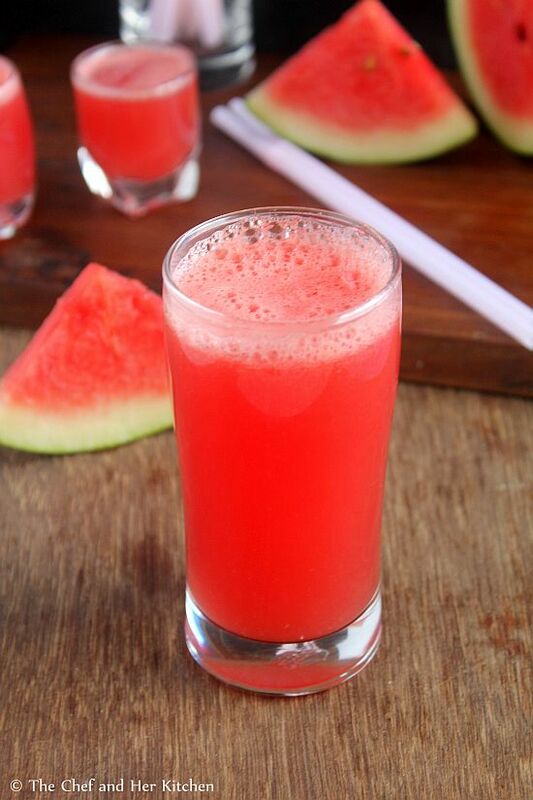 Watermelon juice is a very healthy drink. we make it with mint and lemon. Love your photos. 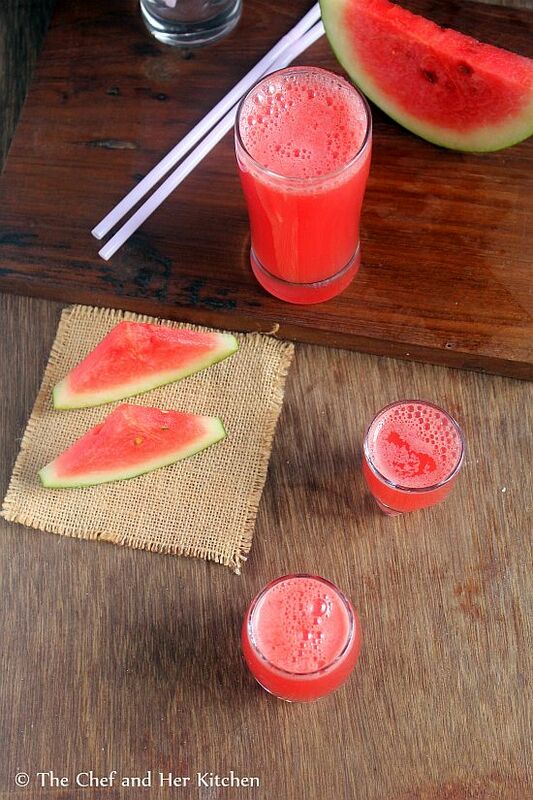 I'm loving the bright red refreshing watermelon juice. so refreshing.. I do it every week.. never get to click so far! sucha beautiful click that is. lovely colour of that drink. nice clicks. 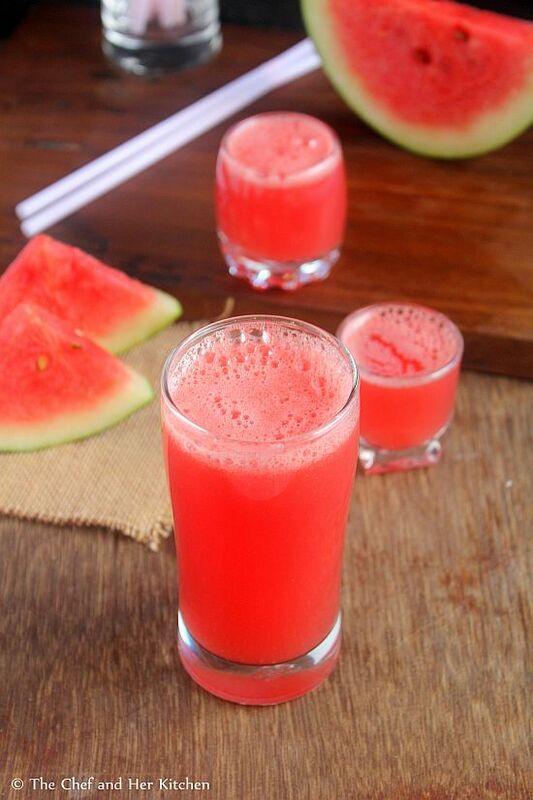 watermelon juice looks refreshing. With all the heat this is what I would love to enjoy.Looks o colorful.